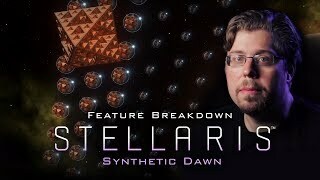 Stellaris: Synthetic Dawn provides an all-new way for players to establish their empire across the stars, starting the game as a Machine Empire -- a society made up entirely of robots. Unique game features and event chains will allow the machines to expand as a robotic consciousness, and create an AI-led network that grows to galactic dominance. Sign up to the Stellaris newsletter to receive news on upcoming content and exclusive deals from Paradox Interactive. You, Robot: Play Stellaris as a customized robotic civilization, complete a series of robotic portraits for science robots, worker robots, and more. AI, eh? Aye! 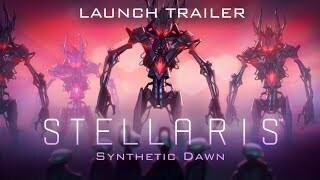 : Follow new event chains and story features to lead your robot race to greatness as an intergalactic AI empire; pursue mechanical perfection in the stars. 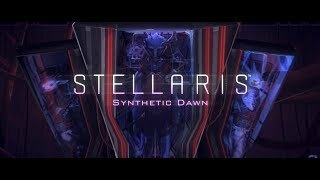 Rise of the Machines: Oppressed synths may rebel against their masters and form new empires -- or you may even discover a fallen synthetic civilization deep in space. Digital Enhancements: New synthetic race portraits, and expanded voice packs for VIR. New Music: Featuring three new tracks from composer Andreas Waldetoft expressing the high-tech theme of the Story Pack. Find help on how to get started, read more about features, or deep dive into game mechanics on our extensive Wiki page. Just starting out? Just follow along and you’ll be ruling the galaxy in no time. Got to know all of the playable species in Stellaris in this in-depth article. Join the discussion on the active Stellaris forums and stay on top!